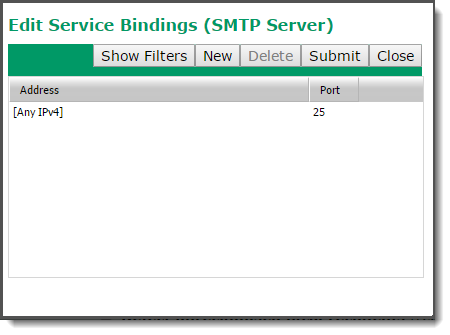 Each service in VPOP3 has 'bindings' which associate an IP address and port number with the service. VPOP3 Basic allows just a single IP address/port for each service, and VPOP3 Enterprise allows an unlimited number of IP address/port combinations for each service. The bindings say which IP address(es) and port(s) the service is listening on. For instance, the default for the SMTP service is to listen on port 25 (the standard port for SMTP), on all local IP addresses. If you have another SMTP server on the same computer as VPOP3, they will clash if they both try to listen to port 25 on all IP addresses, so there are two ways you can make them work together - alter the bindings on one or other of the servers so one is listening on a non-standard port, or set up two IP addresses on the computer, and make each service listen on port 25 on a different IP address. The bindings can be set from the General Services page, or from the General tab in each service's configuration. To edit the bindings, press the Edit Bindings button. To add a binding, press the New button, to delete a binding, select it, then press the Delete button. To save changes, press the Submit button, to close the window without saving changes, press the Close button. The Show Filters button lets you filter the table entries in to only show a subset. To edit a binding, you can double-click on the entries in the table. If you double-click on the entry in the Address column, then you will be presented with a list of IP addresses which are available on the VPOP3 computer, as well as [Any], [Any IPv4], and [Any IPv6]. If you select any of Any options, then VPOP3 will listen on any IP addresses (of the appropriate type) which are unused by any other software and are available on the VPOP3 computer. If the IP addresses change while VPOP3 is running, then VPOP3 will listen on the new set of IP addresses without needing to be restarted. If you double-click on the entry in the Port column, then you can type in the port number which you want VPOP3 to listen on. VPOP3 will check that the IP address/port combination is not already in use when you make changes. Note that it cannot tell if other software may use the address/port combination in the future or if other software which is not currently running would use the address/port combination, so you should still choose wisely.